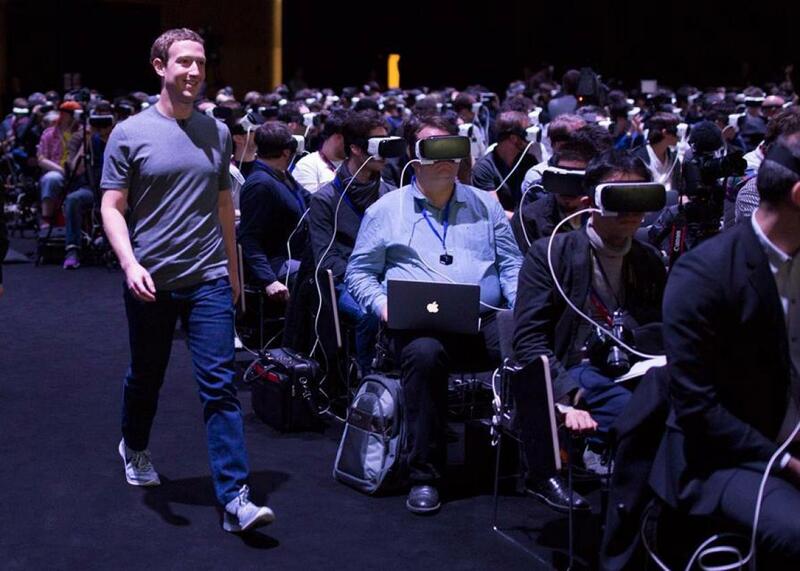 Mark Zuckerberg virtual reality photo at Samsung Gear VR event is less creepy than you think. People are so darn cynical these days. That nice, clean-cut Facebook fellow, Mark Zuckerberg, posted a photo of himself on Sunday making a surprise appearance at a Samsung press conference in Barcelona, where the company was showing off its Gear VR virtual-reality headsets. He was there to talk about how virtual reality is going to be “the most social platform”—a way for people around the world to connect with each other and bond over shared digital experiences. What’s funny about the photo is that the audience doesn’t know he’s there. Because they’re wearing the headsets! That, no doubt, is why the young Facebook executive is grinning: He’s pleased with his clever joke, and he can’t wait to see the surprise and delight on everyone’s face when they take their headsets off and see him up on the stage. But wouldn’t you know it: Some folks are trying to take this nice moment and make something ugly out of it. Imagine being able to sit in front of a campfire and hang out with friends anytime you want. Or being able to watch a movie in a private theater with your friends anytime you want. Imagine holding a group meeting or event anywhere in the world that you want. All these things are going to be possible. Gosh, that makes virtual reality sound almost as fun as the real thing! We mock Zuckerberg now—and yes, it’s possible that VR will crash and burn (again), and this photo will go down in infamy alongside the one of Robert Scoble wearing Google Glass in the shower. But I wouldn’t actually bet against Facebook convincing the world that “social” really means “utterly oblivious to the people around you.” After all, the company has already succeeded in single-handedly redefining the words friend, like, and share. Besides, Zuckerberg isn’t just the president of his own virtual-reality company. He’s also a client! As for the idea that he’s smiling in this photo because he’s just found a brand-new technology that will allow him to rule over a docile human race while we sit happily glued to our respective screens? I don’t buy it. I mean, if Zuckerberg wanted to entrap us all in an alternate digital world where our interactions were mediated by his software and interrupted by his company’s personalized advertisements—wouldn’t he have done it by now?